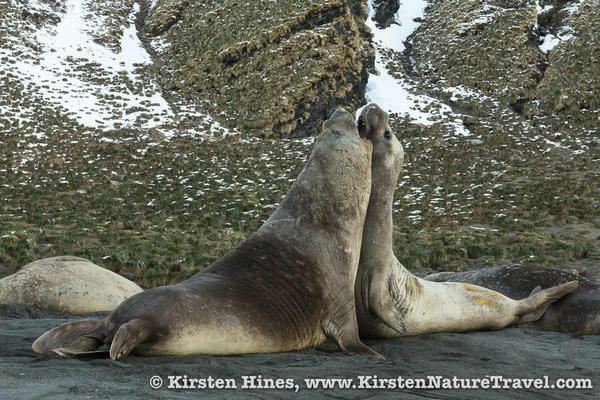 Young elephant seals are called ‘weaners’ from the time they’re weaned from their mother’s milk, around a month, until they reach a year old. They’re undeniably cute, but don’t let those saucer eyes deceive you! 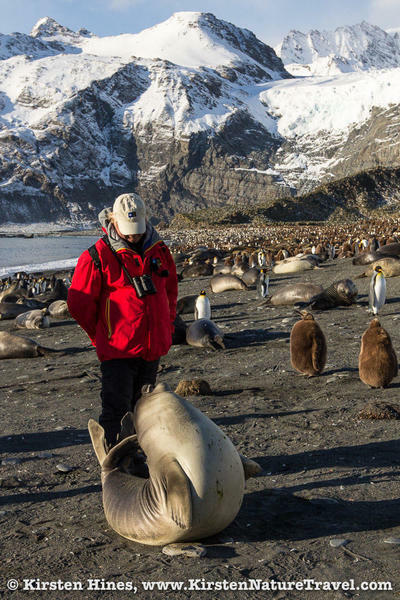 We go to the Antarctic island of South Georgia where one precocious weaner proves warrior training begins young. 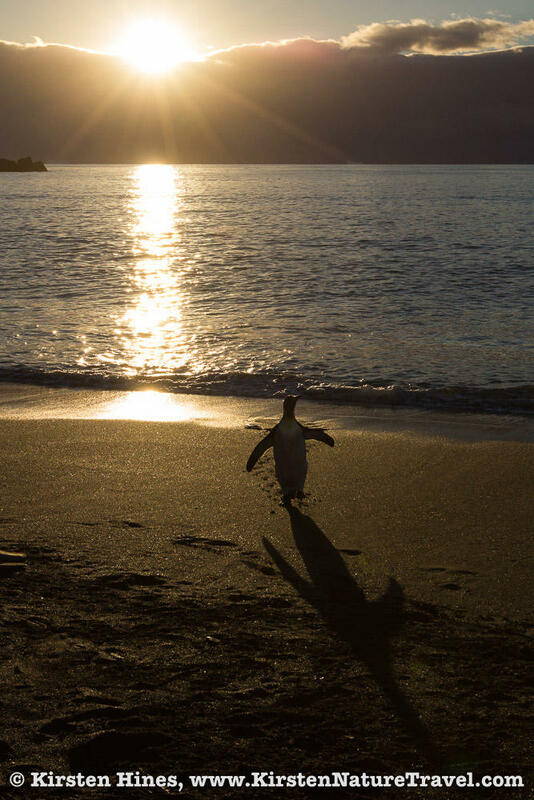 I watch as a penguin emerges from glistening gold waters. 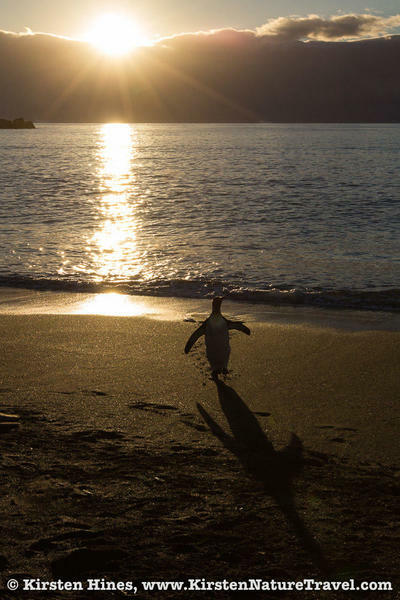 The penguin appears as a shadow against the newly rising sun. It leaves moist footprints in the sand as it pads towards me from the sea. I’m lulled by the tranquil scene, but then the earth tremors. Through my heavy wool socks and rubber boots, I feel the sand shaking. The vibrations get stronger. “Look out!” I hear a warning shout. I whirl toward around and all my calm drains. 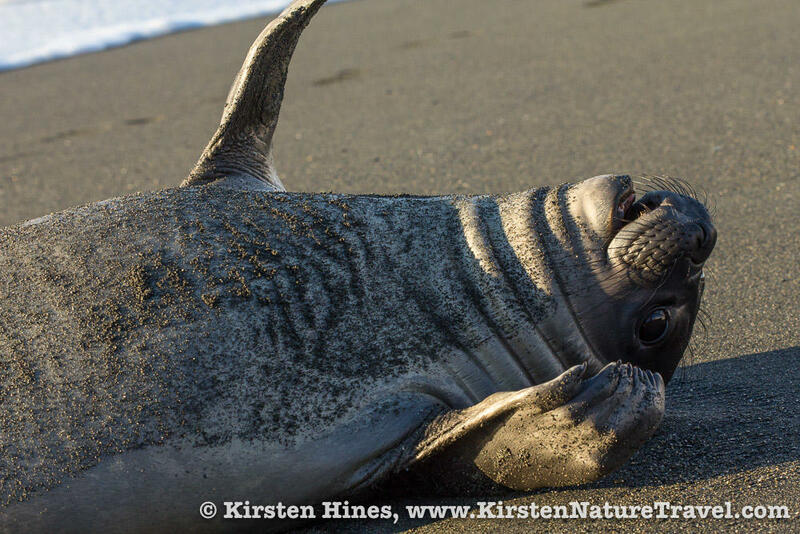 A 4-ton bull elephant seal is charging straight at me. I stare at a flap of skin hanging from one of its impressive, namesake nostrils. It’s blood encrusted, likely ripped free in a recent battle. The flap is jerking up and down in time with each leap forward, the first in a cascading ripple of skin, fat and muscle as the bull closes the gap between us. But the tremors in the sand don’t match the pattern. I turn in the opposite direction and see another male elephant seal barreling at me. This one’s nostrils are intact and flared, emitting steam as they lead this male’s bodily avalanche down the beach. The sand shakes harder, not matching this male’s rhythm either but vibrating to some tune in between. I see their eyes locked on one another and realize neither of the fight-crazed beasts notice my presence. I foresee being squashed between them like some insignificant flea. Inspired, I leap out of the way and clunk my boots up the beach to join the row of human spectators. The bulls crash before us, rearing repeatedly to smash skulls while thundering their superiority. It is a brief but mighty battle. The defeated takes refuge in the water, no new nostril tears but bloodied nonetheless. As the victor flops onto its hard won patch of sand, a new observer slinkies on to the scene. 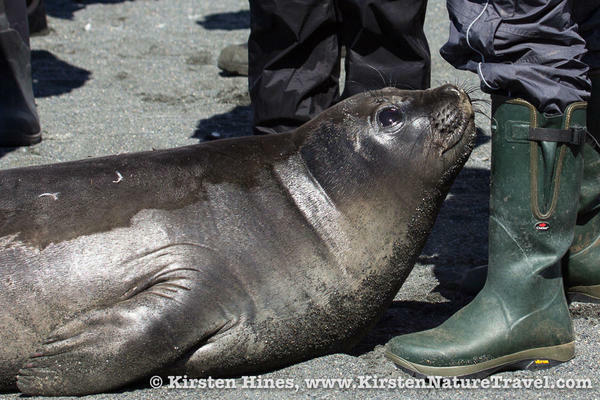 A young elephant seal, a weaner, flops at the feet of my travel companion. It gazes up at us through saucer-sized eyes. Could something so innocent, so endearing, truly mature into some nostril-disfiguring adult someday? The weaner nudges my friend’s boot with its furry nose. We chuckle. The weaner sidles forward and rests its chin on my friend’s boot. We exchange curious looks. The weaner opens its mouth and attempts teething on the toe of my friend’s boot. My friend jerks his foot out of teeth range. 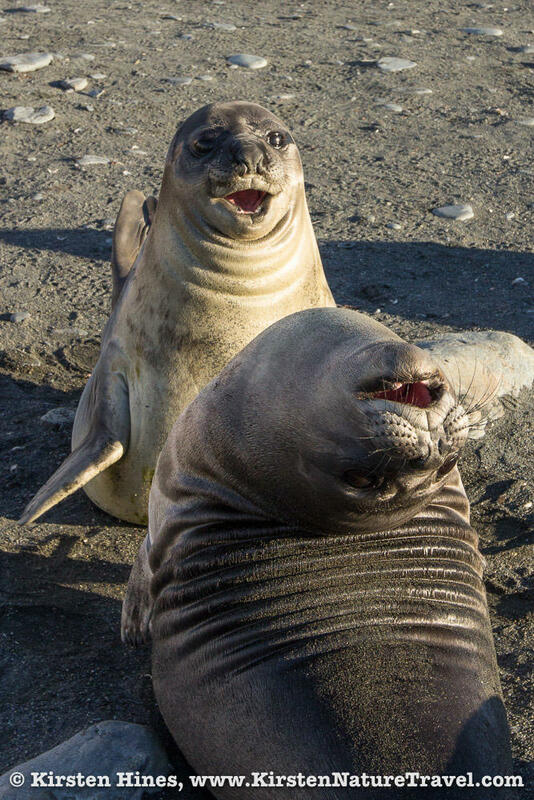 As if offended, the young seal barks at my friend. It continues scolding as it lifts its rotund body into the air, balancing on its tail as it stretches as high as it can toward my friend’s face. Contorted into a circus-style circle, the weaner chides comically. It is far from a thundering war cry, but practice is a must and this weaner has aspirations. 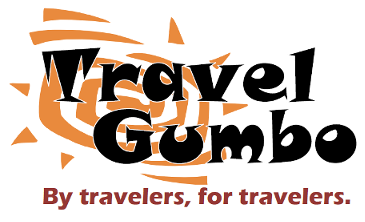 To read the other posts in this series, please click on this link. Weiners with an "i" don't fight back! Nice post, Kirsten.